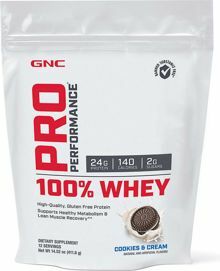 Pro Performance 100% Whey Protein delivers an ultra-high quality macronutrient protein formula with high amounts of naturally occurring amino acids the body needs every day. Whey protein is essential in any nutrition regimen, regardless of age or activity, providing a catalyst to the body for protein synthesis and muscle growth. Far superior to other protein supplements, this advanced formula will provide your body with the pure, clean, high-quality protein you need to fuel muscles while maximizing recovery. Don’t take chances with your results – get GNC Pro Performance 100% Whey Protein and feed your body what it needs. When GNC’s team of research scientist looked to improve this 100% Whey Protein formula, they knew the answer was “more,” specifically through a higher protein formula to enhance nitrogen retention. Your muscles can only grow when your body retains enough nitrogen. And one of the most effective sources of nitrogen for fueling lean muscle mass is whey protein. The specially manufactured, ultra-microfiltered whey protein found in this formula delivers naturally-occurring anabolic amino acids into your bloodstream. This spike in aminos provides nitrogen and subsequently creates a nitrogen-rich environment needed for maximum muscle protein synthesis. Protein synthesis is crucial to the building of lean muscle mass.THE PRO PERFORMANCE QUALITY ADVANTAGEGNC Pro Performance 100% Whey Protein is also tested for banned substances, providing peace of mind in the highest quality formulation. Our researchers created a superior whey protein formula that not only delivers rapid muscle fueling results, but every flavor has a satisfying, delicious, mouth-watering taste profile. Each serving mixes up instantly with a blender, shaker, or a spoon – it’s that smooth and it couldn’t be easier. This GNC Pro Performance 100% Whey Protein is our best-tasting whey protein formula ever.